Cacti make excellent additions to anyone’s garden, veranda, table top, shelf, desk – Indoors or outdoors, the options are endless! And with their amazing ability to adapt to their environment, they are super easy to look after and care for. Cacti like a decent amount of light. If they are indoors, the best place to keep them is next to a window. If they are outdoors, under a patio or veranda in a spot where they can receive indirect sunlight is the perfect position. They can withstand being out in the full sun for most of the year, but some can burn if they are kept out in the sun during the summer months. Ideally, try to aim for a position that has ample light, but only a small amount of direct sunlight. South facing positions are always an excellent choice. Most Cacti have their main growing period in spring, summer and autumn. During this time they can be watered quite frequently. In the middle of summer you may find that they need watering every couple of days. The frequency of watering really depends on the container and the position they are in, as well as the time of the year. The most general rule of thumb is – If the soil is dry, water them! During winter, most cacti go into a dormant state and will need to be kept dry for long periods of time. Watering 3 or 4 times during the whole winter period will most likely be sufficient. Remember, the main culprit of sickly or dying cacti is rot caused by over-watering in winter - so do try to minimize watering during this season. It is also a good idea to keep them under cover during winter and away from the rain. Try to avoid using saucers under your pots unless you are happy to empty them after each watering. Cacti don’t like to sit in water for any period of time. If it comes time for you to re-pot your cactus, remember that all cacti need to be potted into a well draining cactus mix. There are several commercial cactus and succulent mixes on the market that offer adequate drainage, however you can always improve the quality of the mix by adding 1 part of perlite or coarse grain sand to every 3 parts of potting media. Re-pot your cactus every few years to encourage new growth. Mealybug and Scale can cause problems for our prickly friends, but luckily they are problems you can easily rectify. If you see cottony looking bugs or raised spots on the body of your cactus, simply spray them with a systemic insecticide. This will help to keep these pesky little devils at bay. 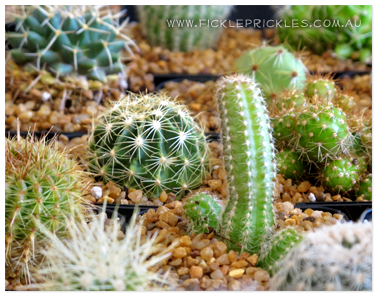 See, it really is easy to look after your prickly friends, and by following these basic tips, your cactus will continue to look magnificent for years and years to come! 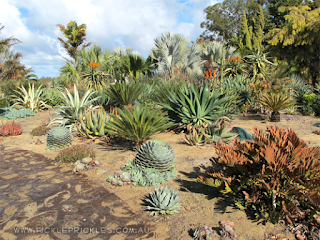 Last Sunday, The Cactus and Succulent Society of WA spent the day at a really remarkable garden on the outskirts of Perth. The owners have been working hard on the property for over 20 years and have based the gardens around their enthusiastic love of succulents and cacti. There was an amazing range of Aloes and Agaves and hundreds of other succulents that have been collected over the years. Several trips to Africa have no doubt influenced some of the collection. There was also an amazing variety of palms and cycads. Rock retaining walls ramble throughout, and the sandy ground only help the succulents thrive in their desert like environment. 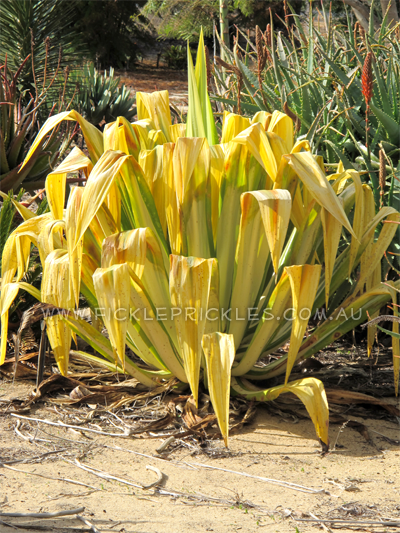 The recent harsh frosts that have hit the Perth area recently have affected almost everyone in the metropolitan area, and this garden was no exception. It was reported that the areas ground temperature reached a minimum of -8 C, and some species had unfortunately suffered. One Crassula ovata (pictured) was very savagely burnt from the frost. An advanced specimen of Furcraea foetida 'Mediopicta’ (pictured) also took a rather severe beating. The good news though is that there is no reason why these plants shouldn’t make a full recovery, in time. The terminal shoot of the Furcraea was still in tact, and the frost damage on the Crassula, although severe, won’t stop it from reshooting when the weather improves. It just goes to show the amazing resilience of these species and their ability to adapt to their environmental conditions. 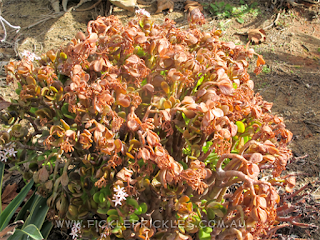 Frost damage on a Crassula ovata and a Furcraea foetida 'Mediopicta’. There were newly established areas in their garden, signifying that the owner’s enthusiasm is still thriving and bound to continue for many years to come. In these new areas, combinations of Golden Barrel Cacti, Pachypodium and other species, as well as large limestone boulders offered an amazing architectural display, even if relatively new. Once this area has had time to establish, it will truly become a wonderful masterpiece to be admired and respected. This property supplied charm and interest, and is a real collector’s paradise. The owner’s should be very proud and no doubt, in the future will keep with the theme and enhance it with further gardens to make it a real botanical splendour. 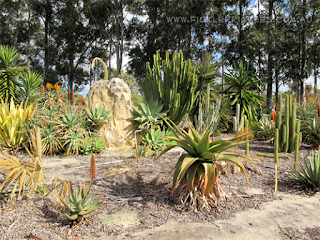 If you would like to become a part of The Cactus and Succulent Society of WA and visit glorious gardens such as this one, you can contact the society on (08) 9277 3924.